Hello and welcome to my Takamine GN77KCE review. This guitar has a nice balance between being bassy enough but with some clarity and thickness to the highs and enough mid-range presence. I would say that it’s on the brighter side but not overly bright. I’d say about a 6/10, if 1 was the warmest and 10 was the brightest. If it was solid Koa, I would say that this would get warmer with age but I’m not sure if the same is true with a laminate construction. The GN77KCE has some decent bass coming through but it’s not overly dominant – there’s still a mid-range in there and the highs come through too. It was a nice balance. Not the kind of tone that blows you away but nice and balanced. This is a good all-rounder. The tone suits either and the body shape suits either as well. And it sounded good with flat-picking too. It’s got a narrow nut-width which is perhaps more suited to strumming and flat-picking than finger-style but that’s more of a playability thing. The GN77KCE has Takamine’s NEX body. This is like a scaled down jumbo – close in size to a grand auditorium. The NEX bodies that I’ve played have produced a really nice balanced tone. It’s a shape that I like. 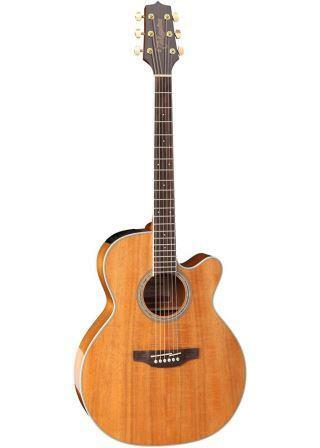 The GN77KCE comes with Takamine’s own TP-4TD preamp and has a built-in tuner and 3 band EQ settings. I liked the feel of this guitar. Somehow it didn’t feel quite as nice to me as the Takamine P1NC that I also played in the same session but I’m not exactly sure why. But still, it was overall a very easy and smooth feeling guitar. The action is a little bit on the high side – but not hugely and compared to most off the shelf it was set up pretty well. It’s a good idea to do your own set up anyway to customize it to how you like it to feel. The neck has Takamine’s asymmetrical feel to it – which I really like. This basically means that the neck is a bit thinner on the bass side. This is supposed to be a more natural fit for a hand. Whatever it is, it felt nice to play to me. The nut width is 1.673″ (42.5mm) which is just a little narrower than the average width. This is great for chord constructions, especially for those with smaller hands but it was still nice enough to play finger-style on. The fretboard is made from Rosewood and that’s no surprise – as it seems that 90% of guitars out there have rosewood fretboards! But that’s just fine as Rosewood typically makes for a good fretboard. Of course not all pieces of wood are the same – but this felt fine. It was nice and smooth feeling. The GN77KCE has a scale length of 25.4” (645mm). This is a pretty standard size for a “full” scale length. This guitar is great for anyone who wants a guitar that is better quality than a budget guitar but still at a reasonable price and for anyone who wants a guitar with a good balanced tone and a nice feel. 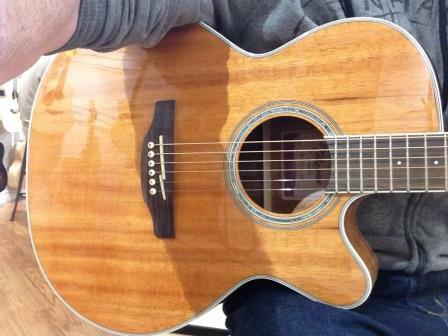 In the same session, I played the Takamine P1NC from their pro series 1. I loved that guitar. The GN77KCE wasn’t in the same league as the P1NC, in my opinion – I liked the GN77KCE but I didn’t love it, like I did with the P1NC. But I wasn’t expecting to like it as much either. In some cases I actually prefer a guitar that’s cheaper – sometimes they can just sound nicer but in this case the difference in price faithfully represents the difference in quality (for my tastes anyway). But the GN77KCE is a good $700 less in terms of it’s MSRP and $500 less in terms of it’s street price. So you do pay significantly less for it – and it certainly is a decent sounding guitar and still nice to play – so for the money I would say it’s still a good buy. But just the way that the P1NC was to play, I would pay the extra, personally. Not that this is a like-for-like comparison, of course, as both guitars feature different tone-woods. If you’re interested in the GN77KCE, are ready to buy or want to check out prices and availability, check out the links below. If you want to check out some more under $1000 options check out the link below.